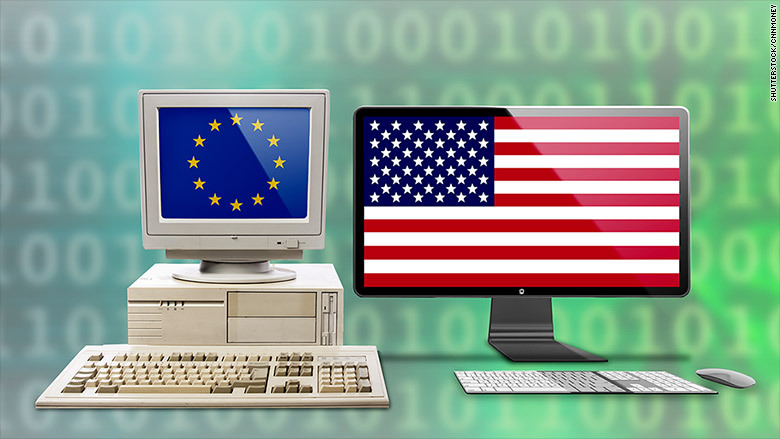 Europe dreams of closing digital gap with the U.S.
Europe is muscling up to Silicon Valley with a sweeping plan to transform its digital industry and boost the power of local businesses. The European Commission released details of its "Digital Single Market" blueprint on Wednesday. It consists of 16 initiatives designed to "tear down" barriers to doing business online across the 28 countries that make up the European Union. Once a world leader in mobile telecommunications, Europe has fallen far behind the U.S. in digital innovation. The plan, which is years away from becoming law, aims to help European companies compete with American firms. "I want to see pan-continental telecoms networks, digital services that cross borders and a wave of innovative European start-ups," said Commission President Jean-Claude Juncker. The Commission estimates that the digital single market could contribute €415 billion ($466 billion) per year to the European economy and create 3.8 million jobs. If realized, Europe's digital blueprint should make life easier for consumers. It aims to give shoppers better access to goods from around the region and address complaints that shipping costs are too high. Europe wants to stop "geo-blocking" -- a practice that diverts consumers to specific sites based on their location -- to give buyers more choice. Tax regimes will be simplified. Another big piece of the plan is an overhaul of Europe's telecoms regime to bring regulations into the digital age. That could help accelerate the roll out of high-speed broadband, and spell an end to pricey data roaming charges that slug individuals traveling across Europe. The Commission also launched a competition inquiry into the region's Internet commerce sector on Wednesday. The inquiry, which was flagged earlier this year, is likely to take aim at Google (GOOG) and Amazon (AMZN), who are big players in the market. The regulator said the inquiry will focus on barriers erected by companies to digital trade across borders to determine whether they are hurting competition. Last month, the Commission brought a case against Google over its search results. The company faces a fine of up to $6 billion, more than a quarter's worth of profits. It could also have to change the way it displays search results in the EU. The EU has punished Microsoft (MSFT) with €1.6 billion in fines over the past decade, and forced the company to give Windows users browser options beyond Internet Explorer.